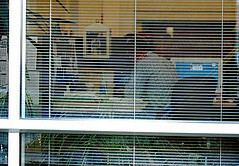 Or we might call this, "reverse windography," the kind of half-assed photo you get when you go outside a building to take shots of the inside. In this case I caught Joel in the act of working! I think. Or maybe his eyes are closed. Who can tell? That's the point. This is a Flickr badge showing public photos from jonfobes. Make you own badge here. THANKS FOR VISITING; VIVA, FERNANDO LLOMO!